Hard to believe that March is just around the corner, but we can't wait because we will get to celebrate the opening of our new quilt shop with you. So make sure you mark your calendar and stop in and see us the week of March 11th. Everyone who comes in will get entered into our Grand Opening drawing for some great prizes. If you would like a chance to win a free yard of fabric every month for a year, then you won't want to miss our celebration that week. Plus you can get additional chances in the drawing with every $25.00 purchase. Other great prizes include: Moda Fat 1/8 Bundle, charm packs, notions, patterns, books and more. We keep adding more to it each day. It's going to be fun!! Special treats will also be on hand..yum! We will also be having specials in the store during the Grand Opening Celebration you won't want to miss. We are excited too because Saturday, March 15th is Worldwide Quilting Day - what perfect timing since we will be celebrating already. Come join us on the first Wednesday of every month from 12 noon to 4pm for some Sewing Therapy. Begins next Wednesday, March 5th. Bring your sewing machine and quilting project or your hand applique project you are working on and escape to our shoppe for some much needed "ME" time! Call the shop to let us know you are coming so we can have a work station ready for you. There is no charge for Sewing Therapy. 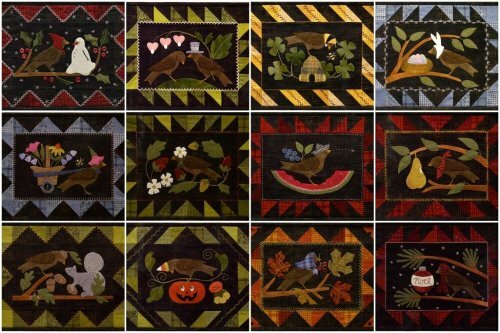 Each month you will receive the pattern from All Through the Night and the fabric from Maywood Studio's Woolies Flannel / Shadow Play Flannel to comlete twelve individual 13" x 17" quilts (backing and necessary buttons is included). We will give you the April kit in March and each future kit and pattern one month ahead so that you can have it stitched and ready to display. Participation is limited so don't delay. Call the shop to sign up. $25.00 a month / with 12 month commitment. Valdani custom thread kit designed just for this block of the month is also available for $31.50. This is a savings for our customer's, the thread pack regularly retails for $37.00. 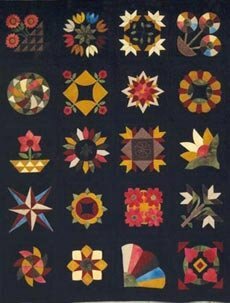 This is a series of 20 quilt blocks which will include many different styles of applique, reflecting designs from the late 1800's to the 1940's. These are truly exquiste blocks, made of the finest quality 100% wool. The vibrant hand-dyed colors include Brass, Barn Red, Woodland Path Green, Jack Boy Blue, Pumpkin spice, Buttercup, Bittersweet, Camel, and Gold. The completed "Wool Bed Rug" consists of 20 blocks, measuring 12" square each, and the overall Bed Rug measures approx 73 x 60. This is sure to become an heirloom for your family. Each month you will receive all the 100% wool needed to make the block along with the floss and pattern. Class will be held on the third Tuesday of every month from 11am-1pm or Thursday from 5pm-7pm. During the class you will learn the basics of wool applique and hand stitching and get started on making the block for that month. If you prefer not to stay and work on your block you don't have to, you can just pick up your block each month. The finishing kit includes everything needed for sashing, borders, and lining the quilt. 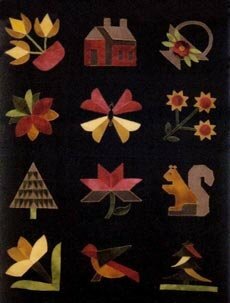 Materials include: the finishing pattern & instructions, 5 yards of pre-felted black wool, and the perle cotton and floss for stitching the quilt together. The optional finishing kit will be $220.00. 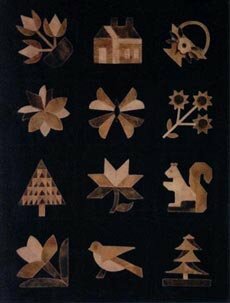 The blocks in this gorgeous wool quilt kit originated from the early 1900's, and is available in two color ways. First is a beautiful chocolate brown on the black and the other is the colorful rainbow of hues against black. This 72" x 55" wool quilt has a real antique flavor to it. Class will be held on the third Tuesday of every month from 2pm-4pm. During the class you will learn the basics of wool applique and hand stitching and get started on making the block for that month. If you prefer not to stay and work on your block you don't have to, you can just pick up your block each month. If you are interested in any of these Blocks of the Month just give us a call or stop in. Space is limited on some, so sign up today. Remember to follow us on Facebook. We post when new things arrive and news about happenings in the store. We also would like to hear from you in regards to notions/fabrics/etc. that you would like to see us carry. This is your store and we want you to enjoy it. We love Show & Tell, so bring in what you are working on or have finished and let us see. Quilters are wonderful people and we are sew happy to be a part of it. Click to visit M&E Quilt Shoppe!